Chicken Satay w/ Peanut Sauce, Cucumber Salad and Jasmine Rice. My son Ben is home for the weekend. He and I are going to go Thai crazy in the kitchen today. I learned all these recipes from a cooking class I took with Su-Mei Yu, owner of Saffron in San Diego. She taught me so much in one class, it was life changing. I’ve since read all her books and try to learn more every time I cook her recipes. Since I’m not a writer, I’ll run through these recipes and I’m sure I’ll miss details, so If you like, get her cookbooks you won’t be sorry. There are a lot of ingredients for today’s menu, so I’m going to post as we go. 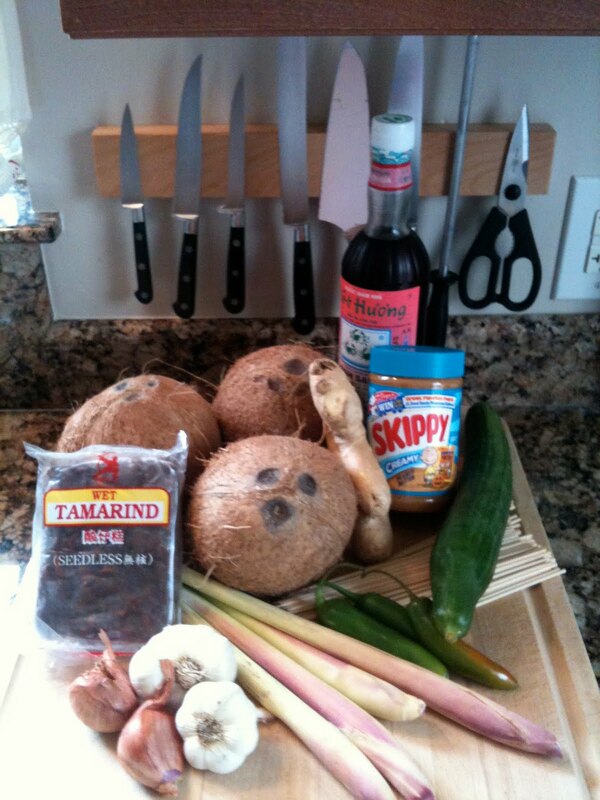 >WIth all of these tasty ingredients, what beverage would you serve with this Thai dish? Dinner is not complete without a tasty beverage to toast the host and compliment the beautiful food.